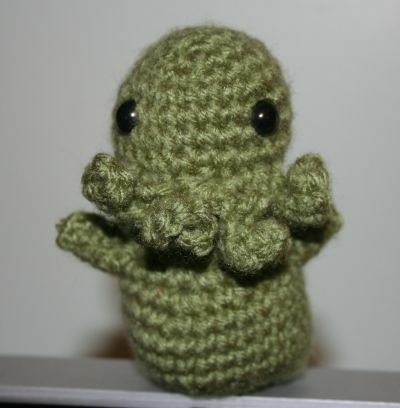 As you may have figured out from looking around my blog, I enjoy crocheting Cthulhu. He is just too adorable in yarn. So I have made several the past few years – which my daughter has claimed most of them. But here is one guy she hasn’t. He is classic green unlike some of my other Cthulhus. He is about four inches tall – maybe slightly larger than some of my other Cthulhus. He seems to stand well on his own – so he would be perfect to hang out on a desk or shelf. To enter the giveaway, you can either leave a comment on this post or ‘like’ the Crochet Mae Facebook page. Spam comments will be deleted and not count towards the contest. If you comment and like my FB page, then that will be two entries into the random drawing. Deadline will be Thursday, February 24th. The drawing for the winner will be Friday, February 25th. I will post the winner and contact them for an address. Good luck! If this goes well, then I will hold another giveaway next month. pick me ‘ pick me……………love ya……….. Awesome! I could see that guy sitting on my desk at work! Good job! Oooooh…. I wants another one! Pick me!